The OT-1 tuner is the latest in color changing technology featuring 4 colors: yellow, red, blue and white. Besides these features, it has a couple others that really round out the package. The tuning needle is very stable and doesn’t fly back and forth like some tuners. This is a big deal for me. Secondly, it has a very solid clip that securely fastens to the headstock of the instrument and swivels up/down and sideways. Lastly, the cost of tuners keeps going down. This current tuner sells for $9.95. Great tuner! Great Price! 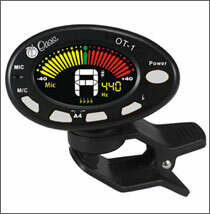 Purchase an Oasis® OT-1 Clip-On Metro-Tuner from Oasis® today.